GlutaBloc™ - Supports Healthy Use of Glutamine. Minimum 94% EGCG to maximize healthful benefits. Free from Pesticide or Herbicide residues. High EGCG (141+mg per capsule). EGCG (Epigallocatechin gallate) > 94%. Green tea breakdown products < 2%. Taking GlutaBloc™ to support health issues: 1 capsules three times a day is typically sufficient. Taking GlutaBloc™ to support serious health issues: 3 capsules three times a day is recommended. Up to 12 capsules a day are recommended by Health Professionals. We recommend GlutaBloc™ be taken on an empty stomach (30 minutes before or 2 hours after eating). Bioavailability is also increased if taken with vitamin C (200 mg) and omega-3 fatty acids (1000 mg). GlutaBloc™ peaks in the blood stream after 120 minutes or 60 minutes when fasting. These levels diminish gradually to undetectable levels in 24 hours. 50% of the blood concentration level has gone in 3.5 hours, 75% has gone in 7 hours. As a Cosmetic: Mix the contents of 6 capsules into a smooth paste with Bravo Yogurt and honey. Apply to freshly washed skin and leave in place for up to 30 minutes. Will deeply cleanse and nourish your skin. 100% Natural - Does not contain sugar, yeast, wheat, gluten, soy, barley, fish, shellfish, peanuts, egg or milk. Kanta M. on 19/Nov/2018 I have just started giving it to my mother, I am rating this product as 6, not sure what the respond from her body should be yet. 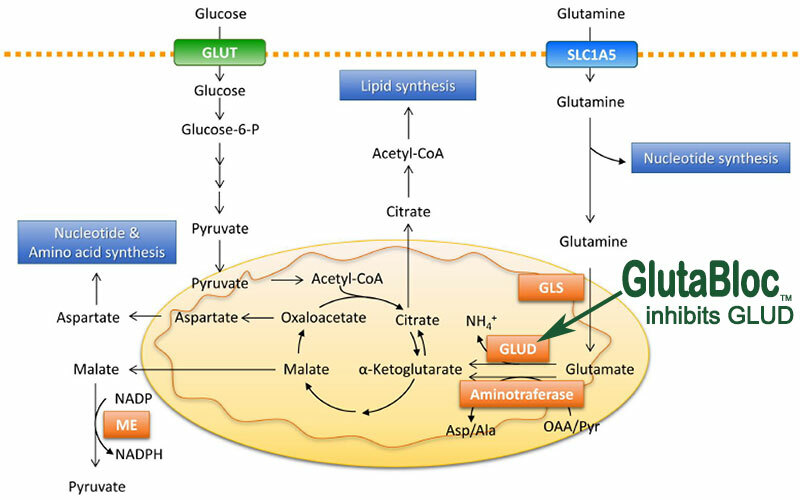 EGCG inhibits the enzyme glutamate dehydrogenase (GLUD), that facilitates cancer cells using glutamine as an energy source. There is currently an early phase clinical trial underway at the University of Texas (https://clinicaltrials.gov/ct2/show/NCT02891538) to evaluate the use of EGCG with Colon Cancer. The dose they are testing is EGCG 450 mg PO twice a day. The product is a natural, caffeine-free, highly purified and refined green tea extract providing 94% EGCG. EGCG has shown to inhibit tumour invasion and angiogenesis which are essential for tumour growth and metastasis. It has also shown numerous health promoting effects acting through different pathways, as an antioxidant, as an anti-inflammatory and as an anti-atherogenic (tending to reduce fatty deposits in arteries) agent.